Hey there friends! I'm here to share with you a fun spring project now that were officially in May! 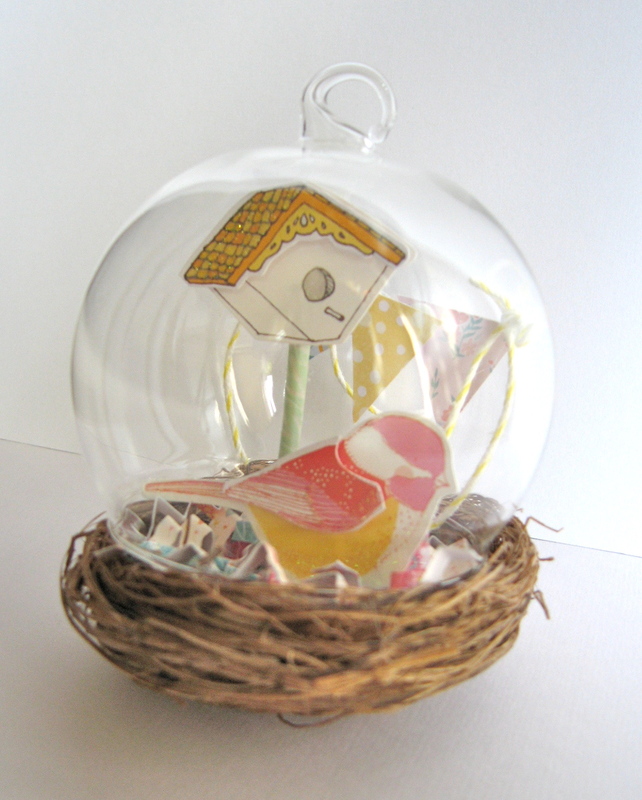 The sunshine and flowers outside remind me of the beauty of nature and Vanilla Sunshine is the perfect collection to celebrate spring with in this cute Little Birdie Spring Globe! 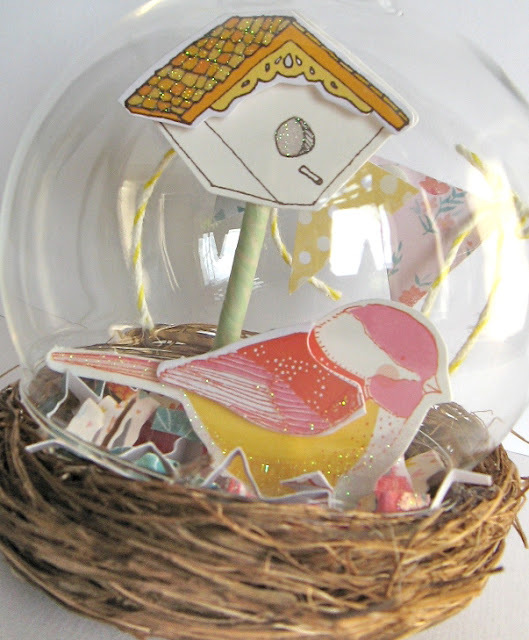 To make this adorable little Spring globe, I gathered together a Melissa Frances Glass Ornament and bird's nest for the base of the spring globe. From SEI, I used the bird and birdhouse dimensional stickers from the Vanilla Sunshine Elements Stickers pack. The stickers were just the right size to fill the spring globe. To cover the nest I accordion-folded paper from the Vanilla Sunshine card making pad and cut them into teeny strips, gently laying them in the nest. The nest perfectly holds the dimensional birdie which I hot glued to the paper strips. I then covered a small skewer with SEi's green chevron washi tape, and affixed the little birdhouse sticker to the skewer, permanently adhering it to the nest with hot glue. I didn't think the bird and birdhouse were enough, and I love to use scraps. I had a lot of little Vanilla Sunshine scraps from other projects laying around, so I created a miniature pennant banner, affixed the pennants together with foam tape and added the white and yellow string that comes with in the Vanilla Sundries pack. I am a huge fan of baker's twine and was super duper stoked to see it in the pack. This was a fun project to make. If you don't have a pre-made snow globe you can make one yourself. Just take a clear, disposable wine glass, trim the stem off and create a base from chipboard using your favorite die cut machine. You could add some twigs from your garden to create your own "nest." eeeek!!! this is phenomenal! thanks for sharing this...it's so inpsiring!